Posts tagged with "iPhone 6s"
Over the past couple of iPhone versions users have complained of “unexpected” shutdowns of their devices. Some iPhone 6, 6s, 6 Plus and 6s Plus devices could basically go dark unexpectedly, forcing a user to have to plug them into an outlet to get them to power back on. Apple has been working on this very annoying bug and it says it has come up with a fix of sorts that should mitigate the problem on a majority of iPhone 6 and iPhone 6s devices. The fix is actually already on your iPhone if you have installed iOS 10.2.1 — something that around 50 percent of iOS users have already done. After letting the fix simmer on customer devices, Apple now has statistics to share on how it has improved the issue, citing 80 percent reduction on iPhone 6s and 70 percent reduction on iPhone 6 devices. These unexpected shutdowns were a different issue than the iPhone 6s battery recall. From personal experience, I've heard quite a few friends mention how their iPhones' serial number weren't eligible for the battery replacement program despite frequent shutdowns. iOS 10.2.1 should fix that, and Apple is also rolling out a new message in the Settings app in case a device's battery has to be replaced. Apple has determined that a ‘very small number of iPhone 6s devices may unexpectedly shut down.’ The problem affects a limited range of serial numbers manufactured between September and October, 2015. If you’ve experienced unexpected shutdowns, contact an Apple Store, authorized service provider, or technical support. If your iPhone qualifies Apple will replace the battery free of charge. If, however, your iPhone needs other repairs that would impair the replacement of the battery, like a cracked screen, those repairs must be completed for the standard applicable fees before the battery is replaced. In addition, if you paid to have your battery replaced before the replacement program began, you can request a refund from Apple. This is the second repair program announced in the recent past. Less than a week ago, Apple instituted an iPhone 6 Plus repair program for phones that lose touch sensitivity. That program carries a $149 repair fee because Apple says the problem is caused, at least in part, by dropping the phone repeatedly on a hard surface. Apple aired two new iPhone 6s commercials earlier today, highlighting the 4K video shooting capabilities of the device, as well as the Touch ID sensor with various iOS app integrations. 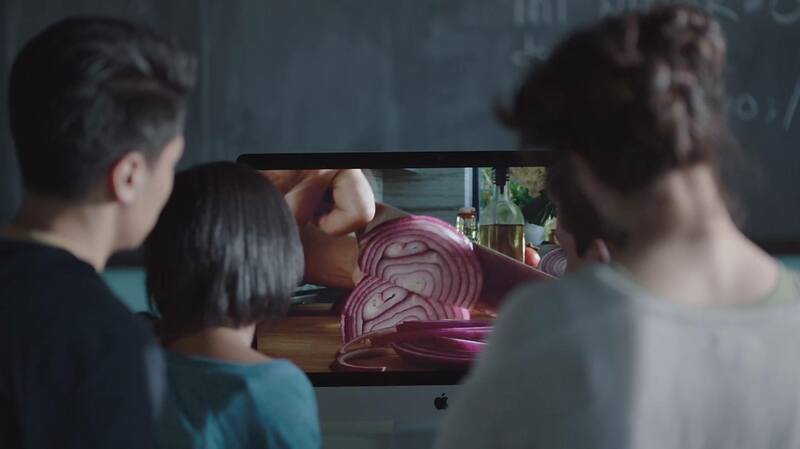 In the 1-minute 4K ad, dubbed 'Onions', Apple imagines a scenario in which a young girl shoots a close-up video of her mother cutting onions that somehow turns into a movie phenomenon. In the ad, the 'Onions' movie even goes on to win an award (with a ceremony hosted by actor Neil Patrick Harris) with a tongue-in-cheek tone that, presumably, wants to communicate how the iPhone's camera can be used to shoot high-quality footage – whether it's an onion or an actual movie. In the second ad, Apple follows the style of its previous, fast paced iPhone 6s commercials to focus on what can be done with Touch ID on iOS 9. The ad shows people paying for products with Apple Pay, starting a car with Touch ID in a dedicated iPhone app, logging into bank accounts, and more. You can watch the ads below. 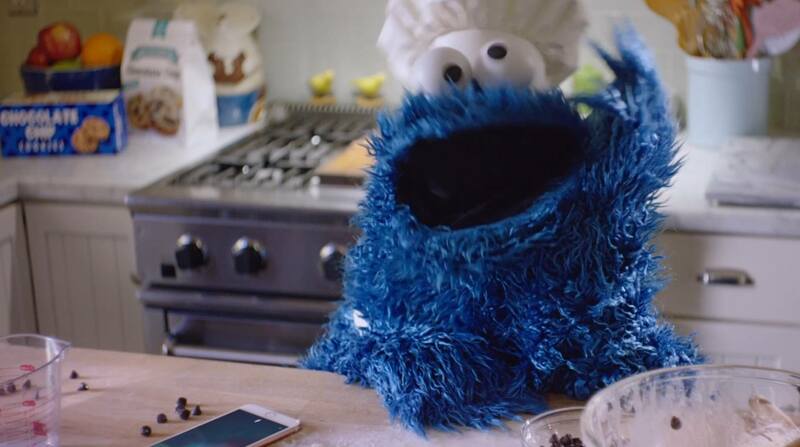 Apple aired a new iPhone 6s commercial earlier today, featuring Sesame Street's popular Cookie Monster character. The ad is focused on the hands-free Siri capabilities of the iPhone 6s. In the video, Cookie Monster unsurprisingly wants to eat cookies and sets a timer for the oven to finish baking them. Cookie Monster asks Siri to set a timer without interacting with the iPhone's display and then asks Siri to check how much is left in the timer, also without having to press the Home button. The ad follows various commercials Apple has aired to highlight 3D Touch and Live Photos, two other features available on the iPhone 6s. You can watch the video below. Apple yesterday published two new iPhone 6s commercials, this time focusing on two features that are available exclusively on the new iPhone 6s; Live Photos and 3D Touch. You can watch the videos below break, and we have also included a transcription of the two commercials. Previous iPhone 6s adverts have included 'Ridiculously Powerful', 'Prince Oseph', 'Hey Siri', 'Flip a Coin', 'Crush', and 'The Camera'. But would you really want to go back to the slower Touch ID? How often, when you unlock your phone, do you want to use one of the lockscreen affordances? And how does the time you lose in those cases compare to the time you gain in all those cases when you don’t want to use the lockscreen? Since I’m in a betting mood, I’ll bet the time you’ve saved overwhelms the time you’ve lost. And I’ll bet Apple studied iPhone usage enough to know that would be the case long before the improved Touch ID was released. Despite the annoyance of my Lock screen being dismissed by the faster Touch ID on the 6s, I think the trade-off is worth it. The number of times I was glad my iPhone unlocked quickly have, in my experience, outweighed the disruption caused by having to re-open Notification Center to view my missed notifications. If we assume that Touch ID is staying in the Home button for the foreseeable future, I wouldn't be surprised to know that Apple is exploring the idea of using the display itself to wake the device. Think about it: why rely on a sensor that is used to unlock the iPhone and why continue to press a button hundreds of times each day when you could turn on the screen just by pressing on it? I shared my theory before, and now that the iPhone's display has a new layer to account for, it seems odd that it's not being used to wake the device without unlocking it. I want to be able to wake the 6s Plus with 3D Touch: this way, I'd be able to press anywhere on screen to do it, and I'd only use the Home button when necessary. Notice the missing step? You're only recharging your iPhone battery once instead of twice. The fact that Apple's case doesn't have a switch means that you don't really have an option to turn it on when you need it or off when you don't — if your iPhone is inside the case, it's being powered by the case. If you do this at the beginning of the day, as soon as you disconnect from the charger, that means that the iPhone remains at 100% until the case battery is depleted, then the iPhone gets powered from its internal battery. The fact that the case is integrated into iOS to provide power status is an added bonus as you get a clearer view as to what your overall battery capacity is. If you remember to have a fully charged iPhone before putting it into Apple's case, then it'll run off the case's battery instead of draining its own. Thus, if you always keep it on and charge both overnight, the iPhone will always start using the case's battery first in the morning. That's smart indeed – too bad I can't try it on the iPhone 6s Plus. Tumblr's iOS app now allows iPhone 6S users to add Live Photos to their posts, just as though they were adding any other photo. When someone on an iPhone comes across it in their feed, they'll see the Live Photo icon in the corner, letting them know it can animate. Like in the iOS Photos app, iPhone 6S users can use 3D Touch to activate the hidden video and sound. If you're on an older iPhone, you can still view Live Photos by pressing and holding on the image. Android users appear to be out of luck, however. Despite receiving an app update today, Tumblr on Android just displays Live Photos as a still image. Same thing on the web. Arguably, Tumblr is the first major social app to integrate with Live Photos. Kind of odd that Twitter and Facebook weren't ready with official support a few days after iOS 9.2 – especially because Facebook appears to be on a 12-hour update schedule for their iOS app. I wonder if Twitter will natively support Live Photos or convert them to their GIF-like format, but with audio as well. I found this game yesterday via 9to5Mac – developed by Asaf Avidan Antonir, Steady Square is a simple game where you have to keep a square steady and let it pass through openings in a series of walls. The twist: on the iPhone 6s, the game is controlled through 3D Touch. Steady Square is extremely basic: there's no sound, no items to unlock, no menus – it's more of a proof of concept, really. But, there's something compelling about the simplicity and silence of Steady Square and I find it to be somewhat relaxing. The collisions are unforgiving (it's reminiscent of Flappy Bird in this sense) and 3D Touch adds an interesting dimension to an otherwise unsurprising mechanic. It's free on the App Store. Also, Steady Square's developer found a way to bypass Apple's rules for scale apps based on 3D Touch. He explains how you can calculate the weight of objects with his game in a video.